When most new employees join a company, they’re left to fend for themselves. Which means they spend their first few months tentatively stumbling around with their first few projects. Then the new employee isn’t productive for at least several months. That’s a huge opportunity cost. Build bonds within the team and larger organization as quickly as possible. Streamline and simplify everything as much as possible. Get the new employee focused on real work right away. Find the right balance to stretch the employee so they’re learning quickly but not stretch them to the point that they feel like they’ve been thrown into the deep-end. Using these principles, I’ve developed a 7 step onboarding process. Once a candidate signs an offer letter, they usually have a daunting task ahead of them. They need to go back to their current employer and tell them that they’re leaving. That’s an enormously stressful conversation even if everyone is parting on good terms. It’s not uncommon for a candidate to sign an offer letter, go back to their current employer, face a bunch of pressure to stay (both emotional and monetary), then rescind their acceptance of their new role. They also need to go to their spouse, friends, and peers to announce the news. If there are any negative reactions from the news, that could also convince the candidate to rescind their acceptance. That’ll leave you scrambling to find a backup candidate. Or having to start the recruitment process from scratch. To increase the likelihood that a candidate completes the transition to their new role on my team, I like to build a lot of excitement right away. I always ask my current team to each send a personal email and tell the new hire how excited each of them is to work with the new employee. Getting a rush of emails from your new team gives you a huge confidence and motivational boost. It’s also a quick way to build bonds between the team and the new employee. The stronger the bonds are and the more excitement there is about the new role, the more likely it is that the new hire joins your team. This keeps the rest of the onboarding process on track. A few days before the new employee officially joins, send a welcome email to them that includes all the basic info about getting started. Everyone’s a little anxious about starting a new role. So having a welcome email that breaks down the plan for the first day as well as all the admin stuff relieves a lot of the butterflies. The new role starts to feel real and tangible. 2-3 thoughtful sentences on how excited you are to have them join the team. An agenda and list of meetings for their first day. Give them any relevant login details on how to set up their work email. If you can’t give them access until their first day, set expectations on what the next steps will be. If you have any HR items for them to complete before their start date, include all of those. Finish by telling them how excited the team is to start working together. Once you have this email written for your company, you can keep using the same template for each new hire. Ideally, I prefer to have new employees start on a Monday. That gives them a chance to plug into the normal weekly cadence of my teams which usually includes a Monday kick-off call. Then they can see how the team operates, what everyone is working on, and get a feel for the normal rhythm. As early as possible in the day, I always get a one-on-one meeting scheduled with the new employee. I welcome them to the team, give them a brief overview of what their first week will look like, answer any questions, and assign them their first project (more on this below). The reason I like to do this as early as possible is that those first few hours and days can feel disorientating for new employees. They’re excited about their new role but they also feel a bit lost. What’s expected of me? What should I be working on? By jumping into a meeting early and outlining what’s to come, it immediately puts them at ease. If you’re in the same office, the one-on-one meeting is also a great opportunity to do a quick tour. I also like to personally introduce them to the team that they’ll be working with. Otherwise, I like to give candidates a few free hours on their first day. It’s a good time to finish filling out all the necessary paperwork, choose their benefits, and get their work environment set up. The sooner this is completed, the sooner that they can get started on a project. Depending on the size of your organization, it will make sense to announce to the department, business unit, or entire company. As a general rule, try to announce 2 levels up in your organization. That’ll cover the vast majority of everyone that the new employee will end up working with and still be a relevant update for the rest of the organization. Sometimes this happens on the first first day that the new employee joins, it depends on how the meeting cadence of the larger organization syncs up with the employee start date. Either way, I’ll simply make the announcement on the next meeting for the larger organization, whenever that happens to be. I do prefer to make these announcements during a meeting, it feels much more genuine and real than just sending an email or Slack message around. Announcing a new hire to a larger organization than just your immediate team has a bunch of benefits for the organization as a whole. Seeing new people join the org is invigorating. It’s a sign of momentum, progress, and that other people want to join us on the same journey. It’s also an exciting piece of news that breaks the normal routine a little bit. Even though it always makes the new employee nervous, it’s also exciting being made a priority on a company update. There’s a lot of self-worth and confidence that employees gain from getting featured like that. Most importantly, the new employee will have a much easier time reaching out and working with folks beyond their immediate team. People are much more likely to help if they know who you are. Without the announcement, people will hesitate when the new employee reaches out since the request is coming from an unknown person. For any role, there’s always a few folks outside that person’s immediate team that they’ll be working with on a regular basis. These are typically the stakeholders on other teams. Bonds generally get built quickly within a team. People are in the same meetings, they bump into each other regularly, and they’re alway collaborating on their projects. But extra care needs to be given to the connections with people outside the immediate team. Work almost always crosses multiple teams and new hires are especially hesitant to reach out to people that they don’t know. It makes perfect sense, we’re all afraid of appearing stupid or wasting someone else’s time. A great way to overcome these barriers and help the new employee feel comfortable working with people outside their team is to set up quick one-on-one’s. They’ll have a much better awareness of how work truly gets done within your organization and they’ll be more willing to reach out to those people when the time comes. Some managers will schedule out all these meetings ahead of time. In my experience, that’s extra overhead and an unnecessary use of the manager’s time. I prefer to assign the scheduling to the new employee themselves. This forces them to get outside their comfort zone quickly and build up the habit of reaching out across the organization when they need to. Specific goals or metrics that the stakeholder is focused on. Things that make the stakeholder’s life easier when working with the new employee’s team. Anything that’s frustrating when working with the new employee’s team. These items will give the new employee lots of awareness on what other people are focused on across the organization and the best way to work with other people. When the time comes to work across the organization, they’ll be much better prepared and likely to succeed. Feel free to keep these meetings informal, grabbing coffee or lunch during these meetings is a great way to build that initial bond. 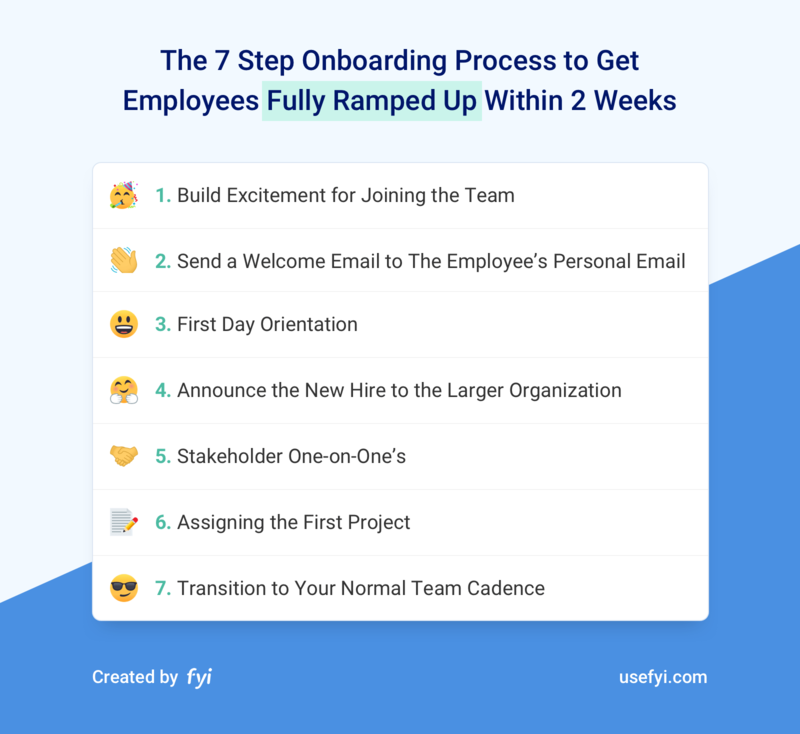 Out of all the onboarding process steps, this step needs the most attention. This is the key to onramping an employee within 2 weeks instead of the typical 30-60 days that most onramps require. I always look for a Goldilocks project. It needs just enough substance that the employee gets started on real work right away, but also accessible enough that I’m not throwing the new team member into the deep-end which will only cause a bunch of anxiety and doubt later. It should take 1 week or less to complete. 2-3 days worth of work is perfect, that gives a bit of buffer during the first full week. I’m always looking for a short turn-around so that I can can give the new employee feedback quickly and get them back on track for a successful project. There aren’t any gnarly political, infrastructure, or organization issues that will slow this project down. For areas that are sensitive or more intense than usual, I save those types of projects for later when the employee is feeling more confident. It’s a bread-and-butter project, it should represent the type of work that the employee will be doing regularly. As much as possible, it’s a real deliverable that will go live or impact a major priority for the business. It’s easy to give a research or background project that won’t really impact anything, but I find that employees get into their rhythm a lot faster once they see how their work impacts the larger goals of the organization. Well defined parameters. It should be a project with a clear finish and scope, leave the giant, ill-defined projects for a later point. I assign this project during my meeting on the first day with the employee. So right away, they’re already getting into their work groove. Then, I schedule my second one-on-one with the new employee exactly one week out. I set expectations with them that we’ll review their progress on the next call so that there’s also accountability with the process. Mon team kick-off call to go over metrics from last week and priorities for the current week. Daily stand-ups on Tues, Wed, and Thurs. One-on-ones between the new employee and myself sometime during the week, or whoever happens to be their direct manager. Fri wrap-up call to celebrate wins from the week. If the first project is picked well and bonds are built quickly in the first week, the transition should go seamlessly without much effort on your part. 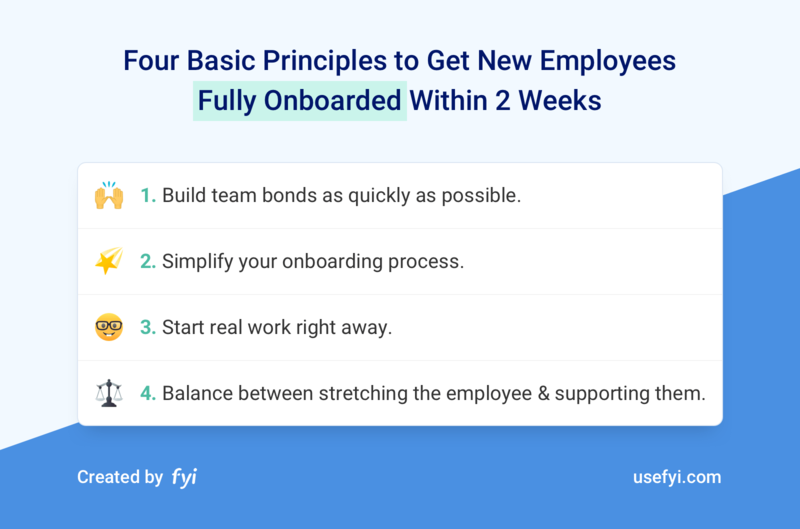 Using the onboarding process steps above, I’m always able to onboard new employees within 2 weeks instead of the typical 1-2 months that it takes for most organizations.